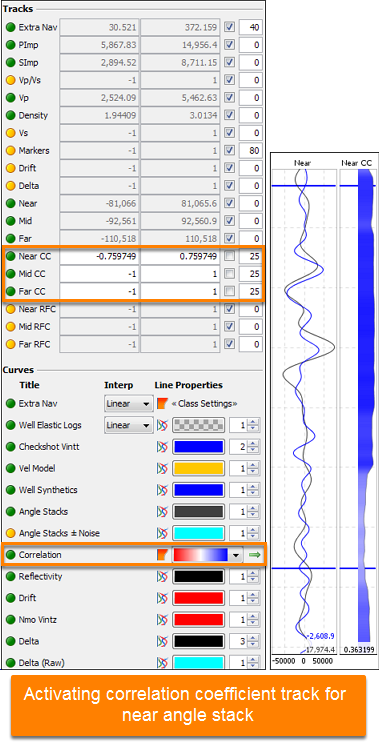 It is possible to display a correlation coefficient track for every angle stack you display in the Synthetics-Seismic Panel. The track shows the correlation coefficient of the seismic and synthetics for a specific well based on a time (ms) window. Under the Tracks section, click the amber circle at Near CC to display the correlation coefficient track for the near angle stack. The amber circle turns green which indicates the correlation coefficient track is now displayed. Likewise, repeat this for Mid CC and Far CC to display the correlation coefficient tracks for the mid and far angle stacks. To adjust the track settings, see "Tracks" in Defining View Settings. By default, the correlation coefficient curve will be displayed in a filled colour plot once you have activated the display of the correlation coefficient track. However, if the curve is not displayed, go to the Curves section in the View tab and ensure that a green circle is shown at Correlation. If it shows amber, click the circle to display the correlation coefficient curve in the track. The correlation coefficient values are shown at the bottom right corner of the track. Open the Synthetic tab and go to the Analysis section to define the correlation window in time (ms). Type the desired correlation window at Correlation Window (ms).